A coalition of young activists is pushing for a "Clean Dream Act" that would do more than just protect those enrolled in DACA. After the demonstration, Pelosi began using the language of the protestors. A few hours later in Sacramento, Pelosi said she and other Democrats were committed to passing a "Clean Dream Act" — immigration policy without any deals that included a border wall. And ever since, she's made the same promise. In response to the protesters, she's said she understands and respects their goals and that passing the Dream Act is just the start of broader immigration reform. "That protest was about all of us or none of us," she said at a press conference the next month. "They want comprehensive immigration reform; we do, too. But right now, we have decided to go down the path with the Dreamers." The strategy that these young activists have employed — that of publicly pressuring politicians is not new, of course. The American Civil Liberties Union has been using the same approach for a long time. Roberto Alcantar, senior immigrant rights policy strategist for the ACLU of San Diego and Imperial Counties, said one of their most successful campaigns have been those that specifically target Republican legislators like Darrell Issa and Mimi Walters. 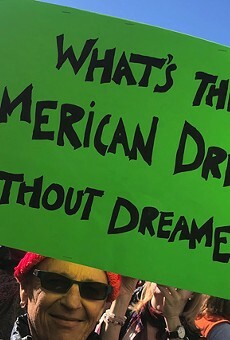 Past campaigns for the Dream Act have included social media, radio, and television ads, billboards right outside their offices, and even lawn signs that Alcantar said were posted in Issa's neighborhood. According to Alcantar, it seems to be working. Issa and Walters have both either made a public statement or signed a letter in support of legislation like the Dream Act. And Issa announced earlier this month that he will not seek reelection this year. Alcantar said Republicans have been the ACLU's main target when it comes to the Dream Act, because that's where they see the most opportunity. But they are supporting the efforts of these youth-led groups to pressure Democratic legislators as well. "If we're not seeing action from our allies, then we will put pressure on them," he said. With all that the ACLU has invested and all that it's willing to do in the future, Alcantar said they're prepared for a long fight ahead. The ACLU's key strategy is to back smaller, grassroots campaigns and organizations like RISE and the Immigrant Justice Alliance. "We want to encourage and support the work that's already been happening even before the ACLU jumped into this fight," he said. Like the ACLU, Prieto and other young organizers are pushing for reform that humanizes all immigrants and undocumented families. "I think we've successfully convinced 800,000 undocumented people that they're worthy of dignity and respect — those are the DACA recipients," Prieto said. They also share their stories on being undocumented and their fears of being deported.